The Competition Center is where you put all the hobbies and skills to a test to see if you can win fame and fortune in the arena! Each day will feature a randomly selected Competition, and once you select a Sim to compete, it starts a 24-hour timer, and your Sim will be unavailable to you until the timer runs out. You'll stand the best chance of doing well in the competition if you use a sim that is experienced in the task of which the competition is. For example, if you have a Cooking competition, then you want to try to use your SIm which has the highest level Cooking Hobby. I don't have a preteen sim for the karate event, how long until I get a new one?? If you finished the preparing for preteens quest and baked a birthday cake and practice the hobby you will get a preteen that can Compete in the competition center. The time really depends on how often you play and how much LP you have to complete actions faster. But as far as I know, the cake took me one day to bake. Hope this helps you. I dont known what to do ???????????????????? I can't figure out how to not do a completion please help!!!!!! The game only lets you build ONE building at a time. 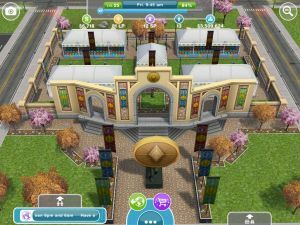 After the "Competition center" is finished being built, you should be able to build the "Real estate agency". My compitition bldg is under construction haw can I cancel it? I've built it too soon. It won't let me build my realty agency now. Why do I enter one competition but it finishes as another? I entered my level 5 cook in a cooking competition, and 24 hours later she'd come 4th in a Real Estate competition, this has happened twice! The competition is 24 hours starting exactly at 12/9 depending on your time zone, so if you enter near the end of the 24 hours, it will put your Sim up against the new competition. What types of competitions? All types? Can i go to competitions of any work or hobbie? When you don't enter a competition, how long does it take for a new one to start? How do you cancel a competition!?!?!?!?! I have mastered pretty much everything and my sims keep coming in second and third. Help plzzz my competition centre says that there is no currant competition and you'll jave to wait for 8759 hours 30 min and 6 sec!!! Wat do I do wat do I do???? If you use time cheats, time-based things take a long time to work. Unfortunately, if you change the time on your device at all, the game assumes that you are cheating, and punishes you by making you wait 10000 hours for time-based events. Howdo you cancel a competition?? My sims always come in 2nd even though they have mastered the skill. Help? I found out....You dont go into the one that holds competitions. You have to go into the one by the ice skating area on the other side of town. Its the building with three people in it right above the fire station. How do you enter the Community Center. It wont let me in to complete my goals. It just keep saying there is a competition!!!???? I try to tap on the Competition Center in another Town but it doesn't let me go to it. It always says there is a new competition. How do you do it in another town? Is there any rationale to this. Is there any actual competition? My level 6 figure skater only wins occasionally but my level 4 ghost hunter wins much more frequently. Is there any other than a random number generator here?